We spend an incredible amount of time in planning and saving for our retirement. Hence, it becomes absolutely essential to choose the right place, when the time for actually arrives, to settle down at a permanent location. The state of Florida in the United States can be your best bet. Some vital factors that are used for determining the best cities to retire in Florida include a significant population of retirees, access to entertainment and health care, etc. Here's the list of 10 best cities you can choose to kick back and relax during your retirement. The many positives of the Sunshine State serve as a motivation for people thinking about relocating to Florida, post retirement. Already been listed as the “cleanest city” and “best outdoor city”, Tampa is for the active adults who intend to retire in style. Climate is one of the major USPs of Tampa with tens of thousands of retirees move to Tampa due to its pleasant weather and friendly crowd. The city houses museums, theaters, and a range of recreational resources. Developed with a master plan, Cape Coral has a cost of living 4% below the national average. Other factors contributing to Cape Coral being the best place to retire include good weather, low serious crime rate, no state income tax and above average air quality. Purchasing homes in Cape Coral is an inexpensive affair and as a senior citizen, you can explore several places and things to do. If you’re a retiree looking for super privacy and luxury, Orlando is the place for you. 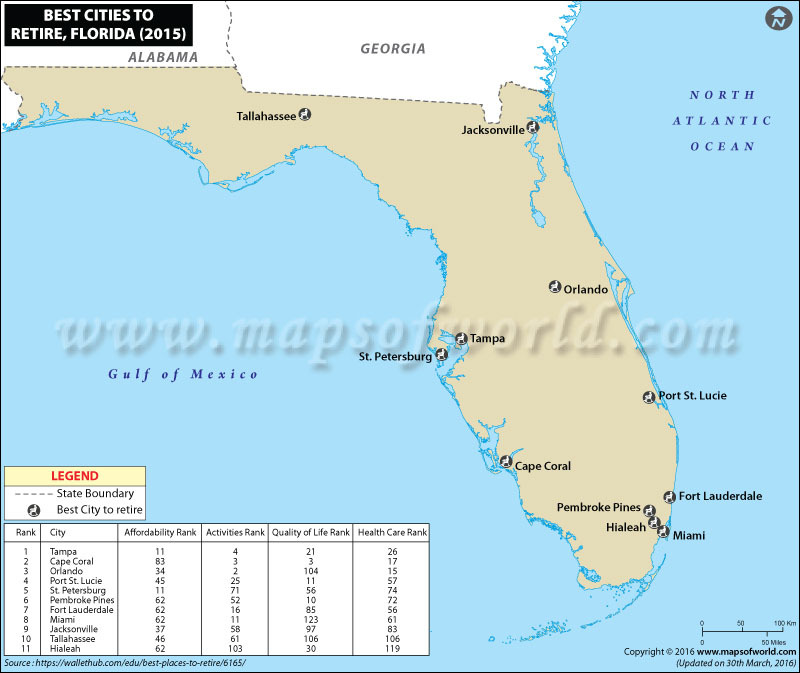 There is an array of communities and towns located near Orlando. All these towns are extremely peaceful and far away from the traffic and bustle. Warm winters are undoubtedly the best attraction of Orlando. Additionally, availability of numerous opportunities like golf, tennis, and fishing turn Orlando an excellent place to retire in Florida. Ranked by Forbes as one of the 25 best places to retire, Port St. Lucie has an excellent climate, above average air quality and a low cost of living (5% below the national average). Price of houses in Port St. Lucie start from as low as $140,000. Additionally, the city’s low crime rate makes it a brilliant choice among senior citizens who’re looking for a safer and peaceful place to spend their days after retirement. Considered as a classic retirement and tourist destination, St. Petersburg has great beaches, the winter warmth and prime shopping areas. If you’re looking to retire in a low-key Florida city, then St. Petersburg can turn to be your best choice. As a decent place to live in, Pembroke Pines doesn’t have any serious traffic and overpopulation issues. With low housing costs, it becomes quite comfortable to purchase your dream home in Pembroke Pines. Conveniently located in southwest Broward County, Pembroke Pines has an easy accessibility to a wide range of primary highways, entertainment venues, golf courses, and commercial destinations. Located in Broward County, Fort Lauderdale has a variety of housing options that can allow retirees to find a place that suits their choice. Popularly known as the “Venice of America”, Fort Lauderdale has been regarded as a popular retirement community since the end of World War II. There are multiple communities and golf courses in addition to high-end amenities that are sought by active adults aged 55+. If you’re planning to retire in a Florida city, nothing can beat Miami. Scores of activities, easy access to health care and affordability make Miami one of the most preferred destinations for retirees. Listed as the best urban city for retirement, Miami has brilliant weather, low cost of living, low cost of a doctor’s visit and low cost of in-home care. Among USA’s best affordable places to retire is Jacksonville. As the twelfth largest city in the USA, Jacksonville has emerged as one of the finest retirement communities for active adults above the age of 55. Whether you intend to go for a paid or a volunteer job, as a retiree you can easily find plenty of jobs in Jacksonville. Moreover, there are quite a few universities where you can live your dream of teaching. Stellar health care services and lower-than-average goods and gas prices make Tallahassee one of the best choices among retirees. Additionally, the sunny weather of the city makes it a favorite among the senior citizens. Tallahassee has a family feel to it and the lack of a state or local income tax makes it a hard-to-miss place for people who’re reaching the stage when they’d retire from a job.